A common approach to perceptual mapping is to integrate both the consumer’s perceptions of the various competing brands along with the preferred/ideal needs for the different consumer segments in the market. This style of perceptual mapping is usually referred to as a joint space map. This is simply because both consumer perception and ideal positioning points are jointly shown on the same perceptual map. Joint space maps are very important when different market segments have quite distinct needs and, therefore, will choose between competing brands and products on a different basis. In this example, the preferences (or ideal positioning points) have been plotted in blue for five different demographic segments. In this case, a simple age-based demographic segmentation base has been used to construct the market segments of: kids, teens, young adults, middle-aged people and older adults. As you can see from this perceptual map, the strength of positioning of each of the brands now depends upon how well (that is, how close they are) to the various market segments preferred (or ideal) positioning points. 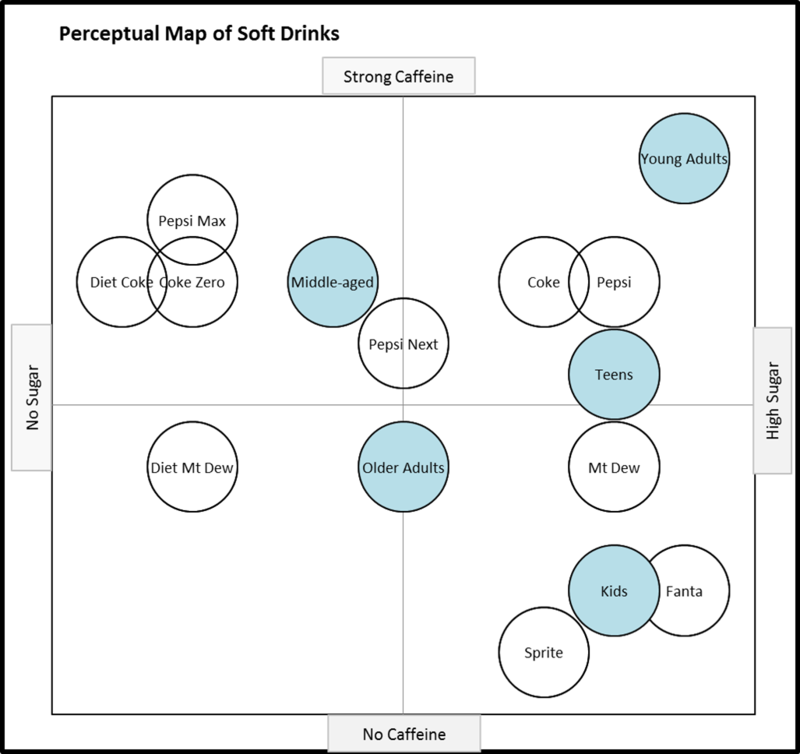 For example, kids prefer a soft drink that is low in caffeine, but is quite sweet (that is, high in perceived sugar). This perceptual map shows that both Sprite and Fanta are well positioned to appeal to this segment’s needs. On the other hand, Diet Coke is a long way from the kid’s target market preferences (being low in sugar taste and high in perceived caffeine0, which means that this brand is perceived as a poor fit to the needs (ideal positioning) of this target map. People in marketing often like to use joint space maps because it is very important to understand the underlying needs and preferences of the different market segments. By plotting the segment’s preferred positioning, it becomes much easier to assess the effectiveness of a brand’s positioning. The above joint space map is very easy to construct using the free Excel template download available on this website. Here is a section of the spreadsheet, which you can click on to enlarge. As you can see, to design a joint space map you simply enter the ideal positioning points for each of the market segments after you have entered the positioning points for each of the brands. Further information: please see the how-to-use and how-to-format guides, plus the page of example perceptual maps.